Octavia Lenora Spencer (born May 25, 1970) is an American actress and author. She is best known for her role as Minny Jackson in the 2011 film The Help, for which she won the BAFTA, Golden Globe, SAG, Critics' Choice, and Academy Award for Best Supporting Actress. Other notable films include Get on Up, Black or White, Smashed, Snowpiercer, The Divergent Series: Insurgent, Zootopia, and Fruitvale Station. Spencer created the character of Randi Rhodes, Ninja Detective for a children's book series, releasing The Case of the Time-Capsule Bandit in 2013, and The Sweetest Heist in History in 2015. Born in Montgomery, Alabama, she has six siblings, including her sisters Rosa and Areka. Her mother, Dellsena (1945-1988), worked as a maid. Spencer graduated from Jefferson Davis High School in 1988, spent two years at Auburn Montgomery studying drama (1988–1989), and received a bachelor's degree in Liberal Arts from Auburn University. In 2003, she made her stage debut in Los Angeles, in Del Shores' play, The Trials and Tribulations of a Trailer Trash Housewife, starring opposite veteran actress Beth Grant. It was her first and only play, as she told Back Stage Magazine that she suffers from "stage fright." Later that year, she starred opposite Allison Janney in Tate Taylor's critically lauded short feature Chicken Party. In 2008, Spencer's brief appearance in Seven Pounds as Kate, Rosario Dawson's home care nurse, garnered her high praise and media attention. In April 2009, Entertainment Weekly listed Spencer in its list of 25 Funniest Actresses in Hollywood. In August 2009, Spencer appeared in Rob Zombie's Halloween II. She also had a role in the American remake of the Danish classic Love at First Hiccup opposite Scout Taylor-Compton. Spencer starred in the hit web series-turned feature film Herpes Boy alongside Beth Grant, Ahna O'Reilly and Byron Lane; and, can be heard as the voice of "Minny" on the audio version of The Help, the "New York Times Best Seller" by Kathryn Stockett. Later that year, Spencer's short film The Captain was honored by the CICFF as a finalist for the coveted REEL Poetry Award. In August 2010, Spencer joined Viola Davis, Emma Stone and Bryce Dallas Howard in Touchstone and DreamWorks' production of The Help, in which she played the feisty and unflappable domestic Minny Jackson. The film was written, produced and directed by Tate Taylor, and produced by Brunson Green, Chris Columbus, Michael Barnathan, and Mark Radcliffe. Her role garnered her critical acclaim, and started talk of various awards nominations. She won the 2012 Golden Globe Award for Best Supporting Actress – Motion Picture for her work in The Help. On February 12, 2012, she won a BAFTA for Best Supporting Actress for her Performance in The Help, and on February 26 she won the Academy Award for Best Supporting Actress for the same performance; making it her first Oscar nomination and first win. Spencer was so thrilled to win that she could hardly speak at the ceremony and was given a standing ovation and was moved to tears during her acceptance speech. In June 2012, Spencer was invited to join the Academy of Motion Picture Arts and Sciences. The Help cast at 18th Screen Actors Guild Awards (Spencer in the middle). Spencer co-starred alongside Kevin Costner in drama film Black or White (2014) and co-starred as Johanna Reyes in the second installment of the Divergent series, The Divergent Series: Insurgent, which was released on 20 March 2015. She reprised the role in The Divergent Series: Allegiant (2016). She voiced an otter, Mrs. Otterton, in Disney's Zootopia, which marks her first animated film. ↑ Octavia, Spencer (January 24, 2012). "Twitter / octaviaspencer: ERM, for some reason I'm being…". Twitter. Retrieved January 11, 2013. ↑ "Octavia Spencer's first book, 'Randi Rhodes, Ninja Detective". USA Today. January 2013. Retrieved February 21, 2015. ↑ Calkin, Jessamy (July 16, 2009). "The maid's tale: Kathryn Stockett examines slavery and racism in America's Deep South". The Daily Telegraph. London. ↑ Greene, Teri (August 14, 2011). "Montgomery native stars in 'The Help'". Retrieved July 8, 2012. ↑ Carlton, Bob (August 7, 2011). "Montgomery actress Octavia Spencer may become a star with The Help". The Birmingham News. Retrieved February 28, 2012. ↑ "Octavia Spencer". comedy central. ↑ Dreier, Peter (February 27, 2012). "Will The Help's Oscar Revive Interest in The Long Walk Home?". Huffington Post. Retrieved May 25, 2012. ↑ Riley, Jenelle (April 5, 2005). "Octavia Spencer: The Quip Queen". allbusiness.com. Retrieved August 8, 2011. ↑ Riley, Jenelle (August 8, 2011). "How Octavia Spencer Landed the Role of a Lifetime". backstage.com. Retrieved August 8, 2011. ↑ Rosen, Lisa (February 4, 2009). "Big impressions in brief roles". Los Angeles Times. Retrieved June 27, 2011. ↑ "Octavia Spencer – The 25 Funniest Actresses in Hollywood". ew.com. April 13, 2009. Retrieved June 27, 2011. ↑ Kit, Borys (April 17, 2012). "Oscar Winner Octavia Spencer to Star in Movie About Controversial Police Killing (Exclusive)". The Hollywood Reporter. Retrieved July 19, 2013. ↑ "Tate Taylor Reunites With 'The Help's Viola Davis, Octavia Spencer On James Brown Pic". Deadline. September 30, 2013. Retrieved October 23, 2013. ↑ Chris Harnick. "Red Band Society Stars Octavia Spencer and Dave Annable on Looking for Life and Laughs in Sickness and Tragedy by CHRIS HARNICK". E Oline. Retrieved 18 September 2014. ↑ "Octavia Spencer Will Battle Kevin Costner For Custody In Drama 'Black And White'". indiewire.com. 8 May 2013. Retrieved 18 July 2013. 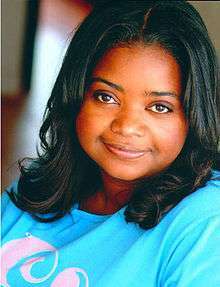 ↑ "CASTING NEWS: Octavia Spencer To Play Johanna In 'Insurgent'". Retrieved 18 September 2014.